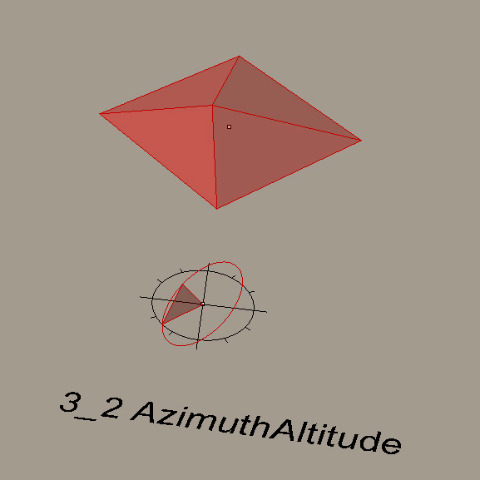 This is a grasshopper recreation of a design pattern 'Azimuth Altitude (Controller)' found in Robert Woodbury's Elements of Parametric Design. A simple sun angle vector calculator is used to control the extrusion direction of a polygon. This definition is structured into two parts: i) the controller and the ii) model. The controller is built from two circles, one fixed in the XY plane and one rotated around the Z axis based on the azimuth angle (sliderAzimuth). An line is drawn from the center of this rotated circle to a point on its circumference based on the altitude angle (between 0 and 90 degrees). The model is a simple square pyramid. It is generated from a polygon that is extruded to a point. The direction of extrusion is given by a vector that is derived from the sun angle line from the controller.